FLASH BACK: ExxonMobil’s Country Manager Rod Henson (left) receiving the Production License from Minister of Natural Resources Raphael G.C. Trotman. ExxonMobil Sunday night said a US$18 million signing bonus was deposited into a government account at the Bank of Guyana last year, and called for such transactions with all other companies to be made public in the future. 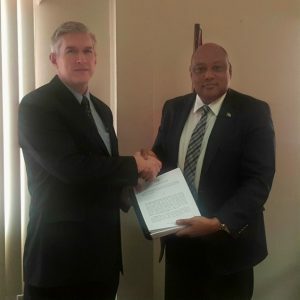 Country Manager of ExxonMobil (Guyana), Rod Henson told reporters that this country merely earned a bonus that is “customary and normal” in many petroleum agreements around the world as part of the total financial agreement. “In this case, this agreement was finalised and negotiations were done and executed. We did pay an 18 million US dollar signing bonus to the Bank of Guyana to an account that is owned by the Government of Guyana and designated by the Ministry of Finance, not to an individual but to a government bank account designated by the Ministry of Finance,” he said. Henson said the money was paid in 2016 but he could not say which month. Initially, the bonus figure that had been floated around was US$20 million. In clear reference to Minister of Natural Resources, Raphael Trotman’s confirmation last week that the funds would be used to pay legal fees for the resolution of the Guyana-Venezuela border controversy, the top ExxonMobil official here distanced itself from any role in the way the monies are spent. “Let me say, also, that ExxonMobil is a commercial entity. We have no role whatsoever in the use or where those funds go, no role whatsoever. We operate the highest standards of business conduct,” Henson said. After Chartered Accountant, Christopher Ram weeks ago first stated that ExxonMobil had paid the signing bonus, the administration only came clean on the issue last week Friday- the same day that the media published a letter by Finance Secretary, Dr, Hector Butts to Bank of Guyana Governor, Dr. Gobind Ganga in September 2016 instructing him to set up an interest-bearing account at the Central Bank to receive a signing bonus from ExxonMobil. The ExxonMobil Country Manager said that with his country already being a member of the Extractive Industries Transparency Initiative, he would expect full disclosure of such transactions when Guyana becomes a full member of that Norway-headquartered watchdog. “In terms of transparency, though, disclosure of these terms is something that should be consistent across the industry instead of one company,” he said. At the same time Henson urged the protection of proprietary and commercial information, ensure they do not violate a country’s laws and should apply to all companies in the extractive industry if transparency is to be effective. Government plans to disclose Guyana’s agreement with ExxonMobil later this month, including provisions for a two percent royalty amounting to US$380 million annually; yearly licence fee of US$1 million; and US$300,000 each for corporate social responsibility and, training and capacity building. Head of ExxonMobil’s Public and Government Affairs in Guyana, Kimberly Brasington said her company has complied with all its laws- “no secrecy”, but disclosure of signing bonuses is up to the government. Asked whether the oil company would be embarking on any initiative to shore up its image, she said the company’s next topic in 2018 would be transparency. Ram has charged that since the money has not been deposited into the Consolidated Fund and is not reflected in the country’s financial records, including those at the Bank of Guyana, the Constitution and the Fiscal Management and Accountability Act have been violated. The political commentator and public policy critic has said the 2018 estimates of expenditure, which will be considered this week by Parliament, was also now under serious question. Ram has called on President David Granger to summon the police and launch an inquiry into the operations of the Ministry of Natural Resources.